It's a sad reality that some expired applications can lead to a massive security breach. Even big corporations with thousands of employees fall into a crisis when things go out of hand. A website security protection vulnerability lends itself for use by cyber criminals nowadays. And with many applications hackers can exploit, the odds are never in your favor. It's essential that companies with online business processes invest on their website security protection all of the time. 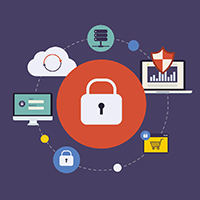 A protected online business can run their business properly anytime of the day without fear of an attack. Although website security protection can be hardly felt, it is still important to ensure the continuity of the business and good brand reputation. If your customers are satisfied with how nicely your website is running, there is a high possibility that they'll keep coming back to your website. Who knows? They might actually recommend your website to a friend. And that's a very positive feedback. When someone wants to find an information, they go seek it on Google. Your common information like store address, delivery, and operating hours are the second most important now. People will most likely rely on Google warning signs like “the site ahead contains malware” to see if you're trustworthy enough. People post anything on social media now. They can definitely slander your company website even if you didn't mean to be hacked. Website security protection is key. Never lose your online reputation out of negligence. When people are satisfied and happy with your online services, your reputation is also boosted. They will share, like, and comment on every single post that you have. If your website was suddenly compromised, people might warn other users to keep an eye on the dangers of going to your website. People are relying on reviews on the Internet. If an online influencer flags your website unsafe, that can lower customer loyalty. Comodo cWatch is here to remove all of your doubts from your manual malware removal methods. It is a fully managed website security protection tool from a 24/7 staffed Cyber Security Operation Center (CSOC) of certified security analysts and is powered by a Security Information and Event Management (SIEM) that leverages data from over 85 million endpoints to detect and mitigate threats before they occur. It is designed into a package where it has Managed Security Service for websites and applications that combines a Web Application Firewall (WAF) provisioned over a Secure Content Delivery Network (CDN). Your team of always-on certified cyber security professionals providing 24x7x365 surveillance and remediation services. Web browsers blacklisted your website. This website security protection tool is an advanced intelligence leveraging current events and data from 85M+ endpoints & 100M+ domains. This website security protection tool has a global system of distributed servers to boost the performance of websites and web applications. This website security protection tool is a powerful, real-time edge protection for web applications and websites providing advanced filtering, security and intrusion protection. This website security protection tool enables merchants and service providers to stay in compliance with PCI DSS. This website security protection identifies malware, provides the tools and methods to remove it and helps to prevent future malware attacks. You need to be proactive in securing your websites and reputation. It is easier to invest in website security protection tools rather than losing your customers. Some website owners don't start thinking about website security protection until it's too late. The trouble of experiencing downtime, reputation damage, and restoring your website is a huge mess than starting with website security protection in mind. Prevention is still the best remedy of all time.